If parenting feels tough right now, you’ve come to the right place. If your child’s behavior leaves you frustrated and feeling out of control, you’ve come to the right place. If you are stuck with how to stop your child hitting or acting aggressively, continually whining or wanting to cling to you all day, you’ve come to the right place. If you are tired of yelling, or tired of feeling exhausted, you’ve come to the right place. Hand in Hand Parenting is a warm community where you can share your parenting challenges and get practical tools to help that are simple to grasp and to apply. You’ll see the change in your family as power struggles stop and defiance disappears. We’ve been supporting parents for almost three decades, and we’re so glad you found us. If you are just getting started with Hand in Hand Parenting, use this post as a guide to getting to know us and all you can do to get support and lead your family to new breakthroughs. And if you have more questions do let us know in the comments. What is Hand in Hand Parenting? We help families stressed with the difficult work of raising children. Our tools help parents build a stronger connection with their children, in a positive, nurturing approach. Which Behaviors Does Hand in Hand Parenting Help With? Child aggression and defianceTantrums, upsets, and meltdownsWhining and attention-seeking behaviorsSleep, eating, and toileting challengesImproving low confidence and anxietySibling rivalrySeparation anxietyOvercoming traumaWe also have parents using the tools with children with autism. Hand in Hand Parenting tools are also used by therapists in practice, doctors and nurses in medical settings, and by teachers and carers in nurseries, daycares, kindergartens, and schools. You can expect to feel more relaxed and confident in your parenting as you learn how to apply the tools and start solving your parenting challenges. How Did Hand in Hand Parenting Begin? Hand in Hand Parenting is a parenting approach founded by Patty Wipfler. The approach is informed by latest brain science, and we have 29 years experience working with parents and carers of children. Today, we are a global non-profit, with certified instructors trained in the Hand in Hand approach working with families across the globe. All sales from our books and classes are used to create more resources, run parenting workshops with underserved communities, and on scholarships for parents who want to take Hand in Hand Parenting classes and can’t otherwise afford to. What Parenting Style is Hand in Hand Parenting? We are an authoritative parenting approach, that is child centered, warm and nurturing. Children raised using Hand in Hand Parenting’s five tools are emotionally-healthy, resilient kids, with a strong parent-child bond. What Ages Does Hand in Hand Parenting Suit? Any age! Whether your child is 3 months, 3 years, 13 years or older and if you live or work with a child, these tools work. Many parents find us when their children are just emerging from babyhood and becoming a person with a voice – and will – of their own, and we also regularly see breakthroughs with children of all ages. It is never too late to adopt the tools and turn around challenging behavior. Hand in Hand Parenting centers on five tools that you can use every day in your parenting, including those really challenging moments. The tools help you understand your child’s difficult behaviors, and give you practical and supportive ways to respond. Some tools can be used as “maintenance” to ensure that your child regularly feels seen and understood, and has a solid sense of the love that you have for them. In the rush of modern, daily life those feelings of love and connection can leave children feeling distant. The behaviors that we can find so challenging and stressful are often calls for help in those times. How Often Should I Use the Tools? You’ll see big boosts in the relationship that you share with your children when you use each of the tools regularly and in tandem. Children become more playful, resilient and confident. They’ll be more cooperative, ready to share and try new things. How Do I Use These Five Tools? It’s up to you! Although the tools work in almost every parenting challenge – including anger and aggression, eating and sleeping issues, sibling rivalry, and sharing, tantrums, and clinginess – we don’t prescribe a one-size-fits-all approach. Why? You know far more about your family than us! 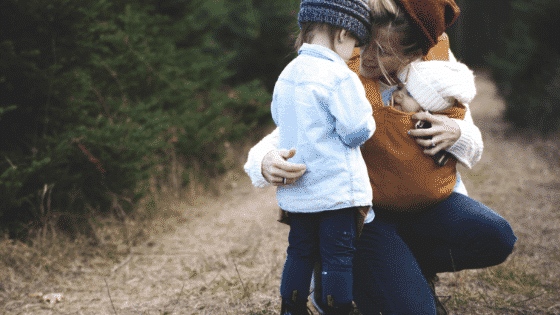 Special Time – Special Time is a tool you can use daily to build trust and connection with your child, and will help boost their resilience and confidence. Setting Limits – Our three-step approach to setting limits is calm, warm and firm, giving your child a solid expectation framework in which to thrive. Staylistening – Provides you with a way to anchor your child through their big upsets and practices co-regulation. Playlistening – Shows you how to respond to your child in their language – using the therapeutic superpower – play! Listening Partnerships – Helps you manage all the worry, frustration, stress and sadness that you can feel as a parent, and return to your family reenergised and repowered. How Is It Possible To Parent Without Punishment? Hand in Hand Parenting’s approach is based on connection and informed by brain-science. We know that when connection breaks, it triggers a child’s upsets. They may signal the upset too us by crying or tantruming, whining, or acting aggressively. Punishments like time-outs, bribing with consequences or rewards further accelerate the feeling of disconnection, and so the behavior continues and often worsens. The Hand in Hand Parenting tools focus on rebuilding the connection so that the behavior stops, and shows you a non-punitive way to respond. Our tools give you a gentle way to parent that for many of us feels new and different – and it can take time to learn and adjust. Our mission as a non-profit is giving you as much support as possible, with places where you can learn, ask questions and find community. You’ll find lots of free support and resources, here on the blog – here is our full article list – as well as in our podcasts, support groups, and classes. Begin: Start by reading these introductory posts, and joining our parent support group on Facebook, where you can ask any questions as you start using the tools in your family. If you have a child over 10, this group is just for you. Move on: Read the book Listen, by founder Patty Wipfler. The book gives a thorough introduction of each tool, with hundreds of examples from real families who use them. It’s available in paperback, ebook and audio and every penny made from book sales goes back to Hand in Hand Parenting. We use those funds to create more resources and run community programs. You can buy via Amazon, audible or direct from us. Starter Class: In our flagship class you’ll work with a Hand in Hand Instructor in a small group (online or in person) and introduce a new tool in your family over 6 weeks. Taming Sibling Rivalry: Understand what’s at the root of sibling tensions, and create a more peaceful home. Helping your Child with Aggressive Behaviors: Effectively stop hitting, kicking, biting, yellingSetting Limits and Building Cooperation: Foster cooperation in your familyHelping Your Child Sleep: Confidently help your child sleep through the nightSay Goodbye to Separation Anxiety: Address the crying, tantrums, and aggression that accompanies difficult transitionsStaying Close to Your Tween: How to use the Hand in Hand tools as your young one turns into a tween. Building a Listening Partnership: Leave guilt, frustration, and a short temper behind as you become a relaxed and more confident parent. Ongoing: Parenting is a practice, and we have many ways for you to get regular support. Join our Parent Club: Membership gives you daily contact with instructors and community, new resources, checklists and reminders, regular Q&A’s with Patty Wipfler, and discounts on classes and other gatherings. Subscribe to the Hand in Hand Parenting Podcast: Get weekly inspiration and encouragement as hosts Elle and Abigail share how they use the tools and how you can too. Join Social Media: Get daily support and updates. You can find us on Instagram, Youtube, Facebook, Pinterest and Twitter. Get our weekly newsletter, with all of our new posts, videos and parenting tips. I’m at Breaking Point! What Can I Do? If your child’s behavior seems unworkable and you are at a loss for what to do, we offer personalised confidential one-on-one consultations. You can find out more here. As a parent, you deserve a community where you can get inspired, support, encouragement and understanding for this demanding role. We hope this post gives you a good starting point for your Hand in Hand Parenting journey. If you have questions, please post them and we’ll reply. The post Getting Started with Hand in Hand Parenting appeared first on Hand in Hand Parenting.